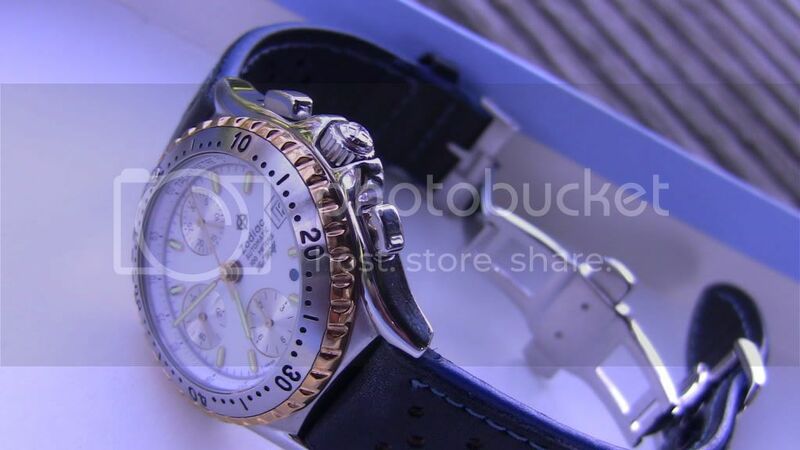 Is this Gold Point Chrono Fake? In the photos of the opened case, I don't see any signed zodiac on the movement? 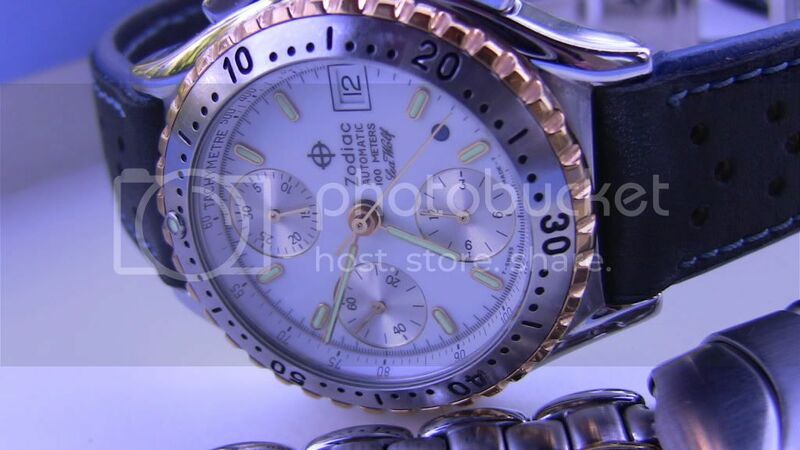 Re: Is this Gold Point Chrono Fake? No, some where not signed on the 90's models, it is OK.
Is it all stainless under the Gold? Would it make sense to take the gold off? I agree, too $$$$ for me. i believe it is all stainless under the gold plate but it is a very tough/ expensive project to remove the plating. An usually looks ugly when done. I have tried that. I have the exact same model, it contains an unsigned 7750 movement, so that part is fine. The lack of gold plating on the inside of the band is normal, so all looks good with the watch if you like the style. The price is too steep for a used example. I bought mine NOS for around $400 2 years ago. 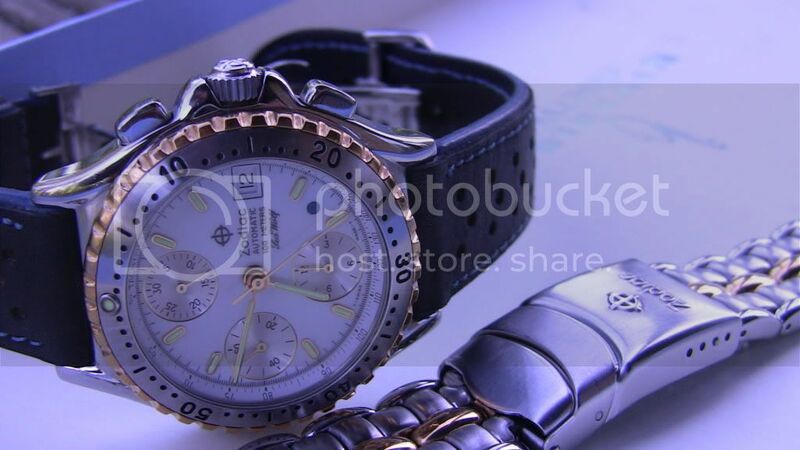 These chrono's are quote nice though, they are small by modern standards, about 39mm w/o crown. The Dials can be a little difficult to rear especially in this shade of blue, lume will be virtually non existant at this stage, although was not much good to start with. The fit and finish on the bracelets is very nice with solid end links and a quality deployment. The square pushers are a nice detail and subtle enough for a watch that is a sports/dress hybrid. PS - This is my first post here, so hello to all and I look forward to participating in the forum. Ahh, you know I was teasing Jon. I am not far behind you my friend, but I built my first PC back in 1984 and took to it like a duck takes to water. If you have the pictures you can email them to me and I will post them for you. Maybe even do a cheat sheet to help you learn. Can you share photos of your chrono? Hi, I only have shots of my two tone version whick are included below, I'm not too up on hosting images so you might need to follow the photobucket links. here goes.. VERY NICE! and both bands--WOW. love the white dial, very clean and easy yo read. SEAWOLF--stop drooling! Thanks Jon, Gary and Seawolf. These shots were actually taken on my canon camcorder. My nikon was toasted at the time and i was out on my balcony (you can see the wooden rails in the background) with a shoebox lid trying to get some images. The blue hue was by accident but worked kinda well. The canon camcorder actually nearly works better for macro shots than the Nikon.